Transport for London’s Lost Property Office (LPO) in Baker Street is one of their lesser known services. 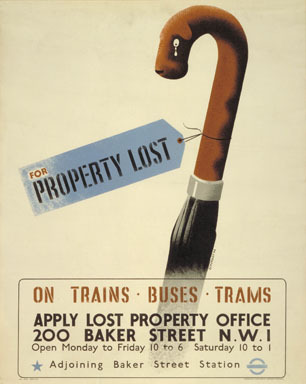 In 1945 Tom Eckersley produced a poster to advertise it entitled For Property Lost featuring an umbrella crying after being lost by its owner. The LPO is fast approaching its 80th anniversary. It deals with items retrieved from the Underground, buses, taxis, the DLR, London Overground and Victoria Coach Station and is such a busy operation that it requires 39 permanent members of staff. The office receives around 200,000 items every year, a large proportion of which are from the Piccadilly Line due to its connection to Heathrow Airport at the western end. Many of the standard items you would expect line the walls of the cavernous space with around 38,000 books, 31,000 bags, 28,000 pieces of clothing, 23,400 mobile phones, 10,600 keys, 8,000 umbrellas and 4,000 pieces of jewellery collected annually. £1 coins are also handed in on a regular basis by honest Londoners! A range of slightly more bizarre items have also been stored here during its history including many sets of false teeth, breast implants, a puffer fish, a coffin, human skulls, prosthetic limbs, wheelchairs, three dead bats, a stuffed eagle, a royal wedding invite, a 14 ft boat, a park bench, a lawnmower and a grandfather clock! Amongst these more unusual items are artworks of varying quality, some of which were gathered together by TfL a couple of years ago and displayed in an exhibition entitled the Lost Collection. Fortunately one in three of the more standard items are reunited with their owners. The LPO staff go out of their way to return the more obscure items if there are clues available. A suitcase containing £10,000 was returned to an elderly gentleman who didn’t trust banks or the safety of the money in his own home. Having left the suitcase on the Tube he was fortunate that a decent commuter found it and handed it in, and that documents containing his address were still inside. Thanks to the detective work of the work of the LPO staff (and inscriptions) two urns of ashes have also been returned to family members of the deceased. The LPO is a good place to monitor trends, current events and the weather, with an influx of umbrellas in the winter and caps in the summer. During the Wimbledon Championships more tennis racquets are handed in and when a popular book is released, such as Dan Brown’s The Da Vinci Code, a significant number of copies are always found on the network. All items handed in are kept for three months and thereafter donated to charity with toys given to less fortunate children at Christmas and prosthetic limbs to landmine victims. Items of great personal value are often retained for longer in the hope that they can be reunited with owners and items of greater financial value are auctioned off for charity and to help towards the operation of the office. Tom Eckersley, the artist behind our featured poster, designed posters for London Transport for 60 years from 1935 until 1995. Born in 1914 in Lancashire, he moved to London aged 20 to become a freelance poster designer, his talent having already been recognised at art college. He collaborated on many commissions with fellow student Eric Lombers and they were greatly influenced by Edward Mcknight Kauffer who also designed posters for London Transport. The pair produced posters for other large organisations such as Shell and the BBC. During the Second World War Eckersley designed propaganda posters for the RAF and the General Post Office among others and in 1948 was awarded an OBE for services to poster design. He later began teaching and was a lecturer at the Westminster School of Art and the London College of Printing (now the London College of Communication). He ran the first undergraduate courses in graphic design in the UK and was Head of Graphic Design for 20 years from 1957 until 1977 with Charles Saatchi one of his more notable students. Eckersley died in 1997. Voting doesn’t seem to work properly for me, what could I do to fix it?